This will be a review for the supplement HairTopia Total. This product comes with 4 bottles meant for a 30 day supply. It is intended for those who are looking to promote hair growth. Please continue reading to see if this product is an ideal match for your health and hair needs. Here is the list of ingredients for the different type of supplements that comes in the four bottles. It should be noted that the ingredients were found on an authorized seller’s site rather than directly from the manufacturer’s site. Other herbal ingredients include: Tumeric, Horsetail Extract, Fo-Ti Root, Rosemary Leaf, Burdock Root, Birch Bark, Rose Hips, Irish Moss, Dandelion Root, Yellow Dock Root, Elder Berry, Oat Straw, Green Tea, Comfrey, Alfalfa, Nettle Leaf, Sage, and Kelp. The manufacturer states that a total of 10 capsules should be taken daily: 2 from the Vitamins and Minerals bottle, 6 from the Amino Acids bottle, 2 from the Herbal Plus. The dosage should be broken up into parts. The consumer should take 1 capsule of the Vitamins and Minerals, 2 of the Amino Acid capsules, and 1 capsule of the Herbal Plus with breakfast. Repeat this dosage for dinner. Finally before bed, the 2 remaining Amino Acid capsules should be taken. The manufacturer states that side effects are rare. However, some possible effects are feeling flushed or warm, or an upset stomach, especially if this is taken on a empty stomach. This item is currently not in stock on the authorized seller’s website and there is no price listed on the manufacturer’s website either. There is a 45 day money back guarantee stated on the manufacturer’s website. The details as to what needs to be done are not easily found. There are generally positive reviews on the website, though it should be noted that there are not such favorable reviews on the authorized seller’s website. This could mean that the manufacturer selects the best reviews to place on their website to lure potential customers. With an extensive list of ingredients, the HairTopia Total system is ideal for someone who already gets all their vitamins and minerals on a daily basis. The money back guarantee is also another positive aspect of this product. However, the lack of price and also the fact that this supplement system seems hard to find can deter potential consumers. Also taking 10 pills during various times of the day is something that can too time consuming or tedious for you. If you are an on the go type of person who does not have time to schedule time for 10 supplement capsules, this may not be right for you. Click here to learn about our Top Hair Growth Products. 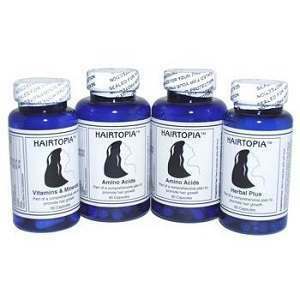 John Brownstone	reviewed HairTopia Total	on July 28th	 and gave it a rating of 3. *The views and opinions expressed in this page are strictly those of the Editor. Results may vary from person to person and cannot be guaranteed. Copyright © 2019 Hair Growth Center- All Rights Reserved. *Results for individuals will vary, depending on existing health factors, lifestyle and level of fitness. The information contained on this site is intended to educate only and is in no way, a substitute for medical advice that your doctor or healthcare provider can offer, with whom you should always consult with before making any dietary changes. Information within should not be used for diagnosis, treatment or prevention of any disease. Testimonials and results contained within may not be an implication of future results. Testimonials on this site are based on the experiences of a few people and you may not have similar results. These statements have not been evaluated by the Food and Drug Administration.